I actually used a random generator to just pick a deck idea and go for it, as it was one day before the tournament and I still had not decided what to play and kept getting new ideas... other decks considered were an Android/Borg Non-Aligned deck, an update of the mirror deck I used in November, a Hirogen deck, Dominion decks (either pure or with Ferengi), and a Revenge Is a Dish Best Served Cold deck (amongst others). I hoped not to face another Borg deck or a big battle deck as my scout ships are easy targets. In general my deck was way to big, and next time I would slim it down considerably. I added the Balancing Act dilemma as one player was attending who tends to be unbalanced (and also in preparation for that most of my dilemmas were s/p). In the end there were three unbalanced players and I played against two of them so it was definitely worth it. Scout vessel, the easy method to report your entire hand on turn one or two stocked with people is just great. The first thing I do when I look at a First Edition Borg decklist is ask myself: would I be able to tell that this is a Borg deck in the seed phase? Afterall, a good part of the strategy in 1E is trying to figure out what your opponent is doing from his or her mission layout alone. Succeed at that, place the right dilemmas in the right place so that your opponent encounters them in the right order, that wins games. I haven't got that figured out at all, but I have identified that skill as something I need to learn. Well, looking at this deck, I can see that I'd know that I'm not only up against Borg, but that I'm up against Harness Particle 010 Alpha Quadrant Borg. Clue #1 is that the mission attemptability icons don't match up well, there are a ton of nebulas, and the odd mission out attemptability-wise is the only planet-icon nebula out there. So, yes, I know I'm up against Borg, but they have so many nebulae it'll then be shot in the dark to figure out where they'll head first. I'd probably bet on the planet nebula (since its nebula status is easy to forget/miss), but then anyone reading this article will know I'm thinking that. Sometimes a land war in Asia seems like a better plan than playing against Borg. I like the use of Borg Scout Vessels here, for a couple reasons. The first is that They Will Be Coming Borg have a Cytherians problem. That is, if they don't have a way to get more ships, and Cytherians is under the wrong space mission, then you can't just Space-Time Portal your ship back to hand like most decks can - you have no way to get your main ship back into play. However, with six scout vessels floating around, you can use them to scout missions, looking for Cytherians. Then you can STP the scouts back and just report them with crew again. Additionally, the ability to land the scout ships with Twelve of Thirteen gives some defense against battle, "God", and Transport Inhibitors all in one card. I like Romulans and it's the only 1E deck I have built. I've been tweaking it since TNG Block came out. James Heaney helped fix some of the dilemma combos I had in it, but I never got around to printing out the cards to fix them. Not really, to answer the second question. No idea. I threw in whatever I thought could be useful. Pegasus Search mission. If you can keep the two mission specialists alive you can get 60 points. Always a Chess Game and The Romulan Underground are both used for the free plays. Romulan Underground is in the Draw deck because I get more use out of Chess Game. The Romulan Underground personnel have some useful skills so I didn't want to remove them or the card for them. This deck looks like a good framework for a player to take and craft into something of their own. It has all of the big Romulan names, it has the big Romulan ships, it has cards for both the major Romulan play engines - Always a Chess Game and Romulan Underground. I would recommend perhaps including more copies of TRU (in order to draw it earlier); doing so could be paired with the the Handshake draw engine to discard the extra copies. Alternately, one might focus on the Traveler/Surprise Party draw engines, and stick to the Always a Chess Game play engine. One end of turn draw in addition to the Continuing Mission draw should be enough to fuel AaCG with the Office of the Proconsul; and once the other end of turn draw engine comes out, you'll be getting increased options for playing each turn. The Handshake engine may be popular, but it can weaken the use of situational cards. Take, for example, Explain Your Presence: it is basically 5 free points... with strings attached. They are pretty light strings, to be sure. 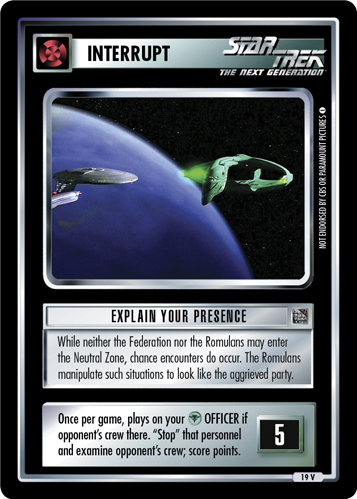 Romulans love being present with your opponent's personnel, because they love to Ambush them and blow them up and stuff. But if you use that card with Handshake, you run the risk that you'll draw it when you aren't ready to use it, and find yourself in a situation where you need to use it as discard fuel. Run it with Ben's Surprise Party/Traveler draw engine though, and that's just not a risk; Explain Your Presence will politely stay in your hand until the time is right. When you think about it, that's very Romulan. First, the other decks I considered using were ones that would be worth at least a play hit for achievements. As to why I chose it, this was of the few remaining 1E deck achievements I need to work on, and I figured this would be the strongest one for a regional environment. I hoped to face other solvers, or non-super fast interference decks. What I did not want to face was too much ultra fast battle/interference as I had limited battle defense in the deck, though I could set up 3 of my free plays at my HQ, and the built in outpost mission gives a little more protection. I really had very little tech against battle other then pure massive speed. I have played similar decks in the past, with Legitimate Leader over Illegitimate, abusing the Zegov + PADD + Tricorder Tech. However, the changes to AAH killed that version but left Illegitimate untouched. I have used the K'chiQ/Kitrik + Androids before, though pre-new NA Data/The One. I have VERY few situational cards, really only Arbiter of Succession. As I never happened to draw it in any games it was never useful. It would have won one game a turn or two earlier for me had I drawn it at the right time, but the game was basically locked any way at that point (In The Zone would have made it impossible for opponent to come back even if they had the ability to solve fast enough), so it did not matter. I would continue to include it. There are a few answers that could fit this bill, but really it has go to Zegov! Close second to Officer Exchange Program, that helps make sure I have just the right free play people every turn with the ability to fetch B'Somgh/Zegov/the guy in the tent. It was a VERY tight, VERY fun, just grass roots, pure speed 2 mission win solver (with Barclay's Protomorphosis Disease normally self-seeded at Navigation planet). ... only to see none! This deck puts the Speed in Speed Solver, and ships just get in the way (unless they can be downloaded with Hidden Fighter like the Cha'Joh can). The Vorn's not even in the tent, that's just too slow; if you need more turns than it takes to get the Cha'Joh and maybe a K'Vort out, something's going wrong. You've got a full four free play engines in a 44 card deck - a 44 card deck that uses Handshake as a draw engine. Fortunately, Klingons have a "digger" in Nu'Daq; as long as he gets played (and doesn't die), you don't need to worry about discarding those Isomagnetic Disintegrators to the Handshakes, because they can come back at special download speed. 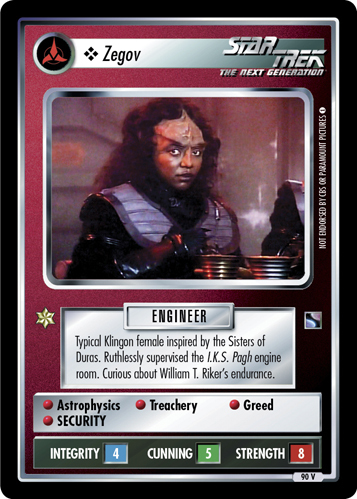 Romulans are the most popular TNG faction to use with androids, since Telak is easily available on the first turn through Defend Homeworld, but Klingons have the second best option: K'chiQ. She plays for free with either Legit or Illegit (but not Attention All Hands due to her AU icon), and with the Handshake engine you'll be happy to use all the duplicates as discard fuel. And hey, once you get Kitrik out with his actual, printed cybernetics, you can just use K'chiQ as one of the best options for cheating out skills in all of First Edition. Also, I had to ask what the Zegov + PADD + Tricorder Tech was in the chat room. The_Ninja_Scot: Zegov will have Medical, Science, Security and Engineer skills. She has two naturally, the equipment gives her the others. Ken -> Worf_Son_of_Mogh: She is an engineer (as is B'Somgh, which makes it even better), Medical Padd and normal Tricorder add 2 classifications, between the two of them they also have some other good dilemma skills. Both are Pagh people so can be downloaded with Officer Exchange Program. Ahh, okay, sigh of relief time. I won't be losing on turn two to a cybernetic Zegov superwoman, fused with PADD and Tricorder technology and bent on my destruction. At least, as long as I'm not playing against Niall. In Open Format. And that's it for the busiest week of the season. Please avail yourself of Daniel's Regional Rundown, stay tuned to the article forum thread for extra credit reading, and I'll see you next week!